Poet/humorist Luís Campos was born to write. At the age of 13 he edited, published, and distributed EL Fuego in Santo Domingo, Dominican Republic. This humorous daily included neighborhood/city gossip, funny stories, etc. In 1948, Luís emigrated to the U.S. and eventually settled in Los Angeles, California. He is the proud grandfather of Roya, daughter of his only son Larry and his wife, Mitra. When Larry was six years old Luís wrote a children’s story for him entitled Kangaroo on a Ferris Wheel, which he hopes to publish. Luís began writing poetry in 1968 and joined the Venice Poetry Workshop in 1969. His poem “Shooting on W. 92nd St.” won first prize in the Bay Area Poets’ Coalition contest in 1984. In 1985 he won second prize in the same contest with the poem “For Lease.” In the same year he won Electrum Magazine?s Unknown Reader Award for his poem “Electric Poem in AC Minor.” He has been published in the Los Angeles Times, Electrum Magazine, Venice Beachhead, Lummox Journal, New American & Canadian Poetry Magazine, Bachy, Venice 13, etc. 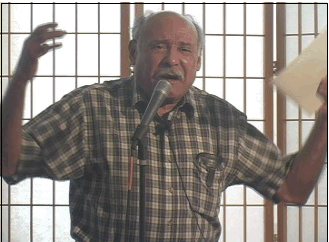 Luís has read at many poetry venues throughout the Los Angeles area and beyond. In addition to poetry, Luís has written two screen plays. He has also created over 7,300 crossword and other puzzles in both English and Spanish for the United Feature Syndicate since 1983. He is the former editor of VOL. NO. Magazine, which was included in the Writer’s Magazine ”Top 50 small press publications in the U.S.A.” in 1983. Luís also creates the wildly popular Celebrity Cipher, published in newspapers and periodicals across the country. He has published more than 14,000 cryptograms and crossword puzzles — in English and in Spanish — since 1984. Luís holds two patents on games & one pat. pend. for Peli Kula, a board game based on movies; part of what he earns from that will go to charity. He is also very proud of his late actor brother Rafael Campos. (“Blackboard Jungle” etc. ).